TORONTO — The 2013 Toronto International Film Festival® shines its spotlight on 10 daring feature films from the city of Athens, Greece for the fifth edition of the City to City programme. The lineup showcases adventurous new works by contemporary directors living and working in this ancient metropolis, and will expose audiences to the fearless cinema emerging from the region. This year’s lineup was programmed by Cameron Bailey, Artistic Director of the Toronto International Film Festival, and Dimitri Eipides, International Programmer for the Festival. The City to City series focuses on the films and filmmakers from a selected international hot spot breaking new ground in cinema, regardless of where the films are set. A 14-year-old girl, an eight-year-old boy, and a bankrupt lumber yard in contemporary Athens. Starring Savina Alimani. Antonis arrives at a hotel resort by the sea. It is wintertime, the hotel is closed and Antonis drifts around alone. He has a lot of time to kill...until the news announces the disappearance of the famous TV host Antonis Paraskevas. Starring Christos Stergioglou and Maria Kallimani. Twice-orphaned J.a.c.e. — a Greek-Albanian child — witnesses a massacre that wipes out his foster family. He then falls into the hands of the predators, ruthless gangsters who traffic children abroad for various reasons, frompanhandling to the organ trade. J.a.c.e. ends up in Athens, begging at street corners, exploring the horrors of institutions for young offenders, or serving obscure patrons in a world where violent loss seems to be his only destiny. The movie follows J.a.c.e.’s odyssey into a dark universe of abuse, murder and fear, as he desperately seeks a family and a sense of belonging. Starring Alban Ukaj, Stefania Goulioti, Argiris Xafis, Ieronymos Kaletsanos, Kora Karvouni, Akyllas Karazissis, Yiannis Tsortekis, Soma Badekas, Diogo Infante, Christos Loulis, Franco Trevisi and Refet Abazi. On the day of her birthday, 11-year-old Angeliki jumps off the balcony and falls to her death with a smile on her face. While the police and social services investigate this apparent suicide, Angeliki’s family insists that it was an accident. What is the secret that young Angeliki took with her? Why does her family persist in trying to forget her and move on with their lives? These are the answers that social services seekwhen they visit the family’s clean and orderly home. The father has made sure nothing is missing and that everything is where it belongs. It seems as if nothing can betray them. But Angeliki’s younger brother unintentionally reveals clues that will gradually shatter the family’s well polished-world, forcing them to come face to face with what they have been hiding for so many years. Starring Themis Panou, Eleni Roussinou, Reni Pittaki and Sissy Toumasi. Anna lives with her dog Manu. She thinks they will live together forever. When he dies, she buries him in a family’s garden across the street. But unlike Manu, the happy, bustling family does not need her love and affection. September recalls that ambivalent mood between endings and beginnings, and the struggle to find meaning in and happiness out of life's ordinariness. Starring Kora Karvouni, Maria Skoula andNikos Diamantis. Antigone moves to a quiet town in search of an unassuming life, unaware of the silent violence that lurks underneath the peaceful surface. Soon, situations around her will force her to decide whether she should take action or stand aside and watch. Standing Aside, Watching is ameta-Western film about indifference, violence and involvement. Starring Marina Symeou, Nikos Yorgakis, Yorgos Kafetzopoulos, Kostis Siradakis, Yorgos Ziovas and Marianthi Pantelopoulou. 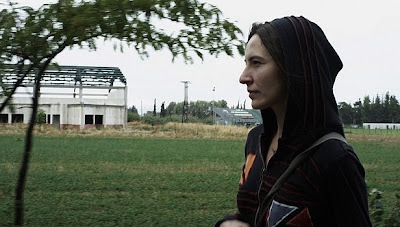 To the Wolf is a stark exploration of two shepherd families struggling to survive in the wilderness of the Greek mountains at a time of deep national crisis.With Ilias Katsaros, Spiridoula Katsarou, Adam Paxnis, Kiki Paxni, Vasiliki Spiropoulou and Giorgos Katsaros. Sotiris is a police interrogator. One day he decides to be fair with people. He is determined to exonerate every single poor guy who committed a small crime because life was cruel. In an effort to save an innocent man, Sotiris kills someone. Dora, a lonely cleaning lady, is the only witness to the crime. Sotiris needs Dora’s help, and even though she lacks compassion, he feels she is his only ally. Will the unrighteous Dora save the virtuous Sotiris? And what about love? Starring Antonis Kafetzopoulos, Theodora Tzimou and Christos Stergioglou. Summer in Athens: a heatwave blasts the city. A teenage skateboarder sets out for a normal day with his friends. A middle-aged man struggles with raising his family — stuck at a job he dislikes and facing an impending nervous breakdown. Inspired by true events, this is a portrait of Athens. Starring Harris Markou and Ieronymos Kaletsanos. Dimitris, an indebted telecommunications engineer, shuts down his business and gets involved in a phone-hacking investigation with an ex-colleague. Their rigorous search on mobile phone antennas leads them to a suspicious flat in a tower block. Dimitris’ attention is caught instantly by an ill woman who lives above this flat. Starring Alexandros Logothetis, Themis Bazaka and George Pyrpasopoulos. Tickets to screenings for this programme will be available for individual purchase as well as through the City to City Pack, which includes all 10 screenings for $113, or $100 for students and seniors. Purchase Festival ticket packages online 24 hours a day at tiff.net/festival, by phone Monday to Friday from 10 a.m. to 7 p.m. ET at 416.599.TIFF or 1.888.599.8433, or visit the box office in person from 10 a.m. to 10 p.m. ET at TIFF Bell Lightbox, Reitman Square, 350 King Street West, until August 19. TIFF is a charitable cultural organization whose mission is to transform the way people see the world through film. An international leader in film culture, TIFF projects include the annual Toronto International Film Festival in September; TIFF Bell Lightbox, which features five cinemas, major exhibitions, and learning and entertainment facilities; and innovative national distribution program Film Circuit. The organization generates an annual economic impact of $189 million CAD. TIFF Bell Lightbox is generously supported by contributors including Founding Sponsor Bell, the Province of Ontario, the Government of Canada, the City of Toronto, the Reitman family (Ivan Reitman, Agi Mandel and Susan Michaels), The Daniels Corporation andRBC. For more information, visit tiff.net.